Biodegradable – EPI technology allows the bags to break-down in as little as 18 months. Extra Large (23 x 34 cm) leak-proof dog waste bags – Our poo bags are made big enough for even the largest of dogs, and thick enough to ensure there are no messes. Fresh Powder Scented – The fresh powder scent will help you forget about what’s inside the bag. Recyclable – Our cardboard cores and packaging are made from 100% recyclable materials. 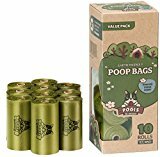 Everything You’ve Ever Wanted From a Poop Bag – Extra Large, Leak Proof, and Biodegradable! * Biodegradable – Our specially designed bags begin to break-down in as little as 18 months, keeping parks and landfills plastic free. * Extra Large Leak-Proof Bags – The 23 x 34 cm bags are made big enough for even the largest of dogs, and thick enough to ensure there are no messes. * Fresh Powder Scented – The fresh powder scent will help you forget about what’s inside the bag. * Recyclable to the core – Our cardboard cores and packaging are made from 100% recyclable materials. Here at Pogi’s, we create awesome products that make caring for your pet a breeze. We stand behind our products with a 30-day no hassle return policy, and a 100% Satisfaction Guarantee. Click the ‘Add to Basket’ button on the upper right corner of the screen to order. Cadbury Mini Chocolate Snack Selection Pack. Animals, Dinos Dinosaur & Mini Fingers. 17 small bags for Kid's Parties, lunch boxes, Snacks. This entry was posted in Aquatics and tagged bags, Biodegradable, Large, LeakProof, Pogi's, Poop, Rolls, Scented, Waste by One Boutique. Bookmark the permalink.